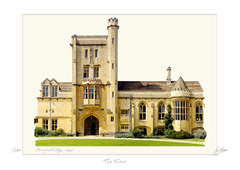 Mansfield College was originally founded in Birmingham as Spring Hill College, for the education of Nonconformist ministers. When the University's attitude to Nonconformists was relaxed the College was re-founded in Oxford and named after the founders' family. The buildings, opened in 1889, house all the College's public rooms, were designed by the Victorian architect Basil Champneys. Unlike his other red brick buildings, Mansfield was built of stone in Gothic style. The buildings are placed round three sides of a central grassed area. The entrance to the College is in Mansfield Road, and not through the picturesque tower as might be expected. To the left of the tower is the JCR and second storey library and to the right the bay windowed Dining Hall. The perpendicular Gothic Chapel has an unconventional feature in that it faces north.